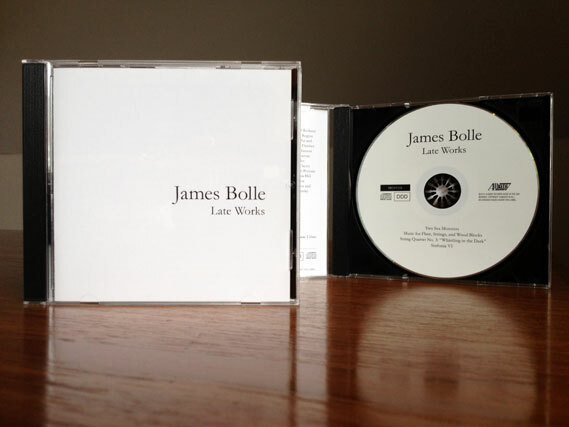 Purchase James Bolle Late Works from Albany Records. Listen to Sinfonia VI on SoundCloud. Listen to the premier performance of this song cycle by James Bolle with text by August Kleinzahler. from James Bolle’s 80th Birthday Concert at the Peterborough Town Hall, Peterborough, NH, August 20, 2011. Around 1990 I discovered a new (to me) way to organize an extended instrumental work. This involved discrete sections, each small independent piece to be experienced separately, with short pauses between the sections. One thing happens and then another thing happens. It is left to the listener to make something (or nothing) out of the juxtaposition. The various sections are quite different one from another, expressing contrasting characters and moods. The pauses give an opportunity to rest, regroup, or drift away. The larger pauses between movements are just bigger, longer silences. The New York poet Frank O'Hara when asked to describe his work called it "personism," and then said he didn‚Äôt know what that meant. He described these poems as "I do this, now I do that." Perhaps "personism" is applicable to my music, in that I speak (sing) directly to the listener, not about some other story or subject, but like a conversation, except that the subject changes a lot. Another comparison is with landscapes of David Hockney. Recently he has made paintings of his native Yorkshire composed of several small paintings, separated by spaces, which can be viewed as complete in themselves, or as part of the whole. Later he did a mural-sized painting of the Grand Canyon made up of sixty separate paintings with more muted colors, making an even grander application of this idea. This way of creating is (maybe) similar to my approach. A characteristic of the three Sinfonias is that they have other composers' music stolen and inserted in the mix. This juxtaposition is both frivolously idiosyncratic and a deeply felt bond with the music of the distant past. String Quartet No. 3: "Whistling in the Dark"
James Bolle Late Works may be purchased from Albany Records.